In “Our Little World” the boys get one step closer to learning more about Supernatural’s greatest mystery—the Darkness. Castiel (Misha Collins) finally tracks down Metatron (Curtis Armstrong), but the fomer scribe of God is pretty settled in his new life. The teenage version of the Darkness, Amara (Samantha Isler), on the other hand, is much less satisfied by the life Crowley (Mark Sheppard) is offering her. “Our Little World” was written by Robert Berens and directed by John Showalter, both experienced members of the Supernatural family. “Our Little World” serves to carry forward Supernatural’s Season 11 story arc of the Darkness. Although it doesn’t give us any new monsters to defeat or cases to investigate, it manages to keep things interesting. 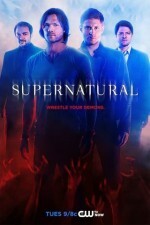 Supernatural revisits the conflict between Castiel and Metatron, and frames Amara as a rebellious teen to Crowley’s overprotective father figure. The Darkness is growing up, and Crowley doesn’t like it one bit. How do you solve a problem like Amara? Despite his best efforts to parent this powerful entity, Amara is bound to go her own way. If she develops enough gratitude, or at least some tolerance, in regards to Crowley, perhaps she won’t eventually murder the King of Hell. We’d call that a win. Of course, if she destroys all of God’s creation out of pure vengeance, Crowley will be out of luck anyhow. Poor Crowley—everybody leaves him. His attempt to present himself as a fatherly figure to Amara was bound to end in failure, leaving him alone with his minions once more. Though Sam might want to forget about Dean’s and Crowley’s “summer of love,” no one else does. We still miss the bromance of Demon Dean and Crowley. Crowley might have revealed himself beneath his blackened soul when he exclaimed, “I just want to be loved,” during Sam’s attempt to cure a demon in the Season 9 finale. Sure, his efforts are probably about the power, but isn’t power just a substitute for the love of an absent father and witch of a mother? It’s fun to humanize Crowley, if only because he would hate it so very much. Dean’s failed attack of Amara reaffirms that she does have some kind of power over him, borne out of their connection. How long will her fascination continue and their protection of each other continue? Even with all of Amara’s screen time in “Our Little World,” she remains quite mysterious. In contrast to the limited intel gathered from the attack on Administrative Hell, Castiel’s efforts to squeeze information from Metatron proved much more fruitful. Metatron spills God’s family secret: God sacrificed his sister, The Darkness, to create the world. And you thought Sam and Dean had a tumultuous family relationship. Teenager Goldie has spent her evening complaining about her mom and eating snacks. Sounds like a fun teen evening. Not. After her friend leaves, Goldie is surprised by Amara. The first thing Goldie asks is, “Whoa. Hey. Where are your parents?” It seems that Goldie has an unhealthy fixation on parental figures. The Darkness doesn’t have any real parents, but she does have an overprotective King of Hell trying to play the father figure. Amara says that she wants something from Goldie. It turns out that Amara wants what every teen wants—to be like other teens, of course. After she takes Goldie’s soul, tween Amara turns into teenager Amara. That’s when the trouble always starts. Back in Administrative Hell, Crowley is waiting up like a nervous father. He doesn’t like teenage Amara sneaking out. Crowley is no better than Goldie’s mom, because he wants to limit her snacking. When Crowley grounds her, Amara protests, but he tells her, “You’re strong, but you need to remember, I’m stronger.” A petulant Amara glares at him and says, “For now.” Watch out, Crowley—teenage girls are the worst. Sam and Dean aren’t having much luck tracking down Amara and decide to bring Castiel back into the action. If you have an angel friend hanging around, why not use him? Unfortunately, Castiel has become a bit of a couch potato, and has to be cajoled into action by Dean. Castiel suits up, but seems to be having a bit of angel PTSD as he remembers how out of control he was when he was under Rowena’s attack-dog spell. After his flashback, he heads back to the bedroom to eat and watch more TV. The demon ranks in Administrative Hell have been thinned by Amara’s appetite for souls. One of Crowley’s minions has failed to leave a guard at Amara’s door and gets a demotion from the King of Hell. Crowley reminds the demon that her door needs to be guarded 24/7. Seems like this plan only serves to provide her room service snacks. Sam and Dean get a call from Detective Madsen (Claude Knowlton), whom they worked with during “Thin Lizzie.” It turns out that soulless Len is dead (Awww! We loved him!). Sam and Dean check it out. Once they arrive, Sam and Dean see teenager Goldie, who tried to kill her mom with a frying pan, acting strangely. Hormones, a lack of a soul, and a mother who smokes menthols seem like a deadly combination. In her jail cell, Goldie gets a demon visitor who’s there to clean up Amara’s mess. He enters the cell with murder in his eyes, but finds himself in a Devil’s Trap. Sam and Dean take the demon away for questioning. Since they leave Goldie behind, we can only assume that soulless Goldie goes on to murder everyone at a juvenile holding center. The demon tells Sam and Dean that Amara has been eating all of his demon buds, even though she’s also been sneaking out for midnight snacks ever since Crowley put her on a diet. The demon tells the Winchesters that he’s not going to tell them where Crowley is keeping Amara because they’ll kill him anyways. They don’t have the best rep for keeping their deals in the demon world. Sam suggests they exorcise the demon and save his meatsuit. Wow! They’ve been killing possessed humans for so many seasons now. Sam really is resetting the rules—well, trying to, anyway, because they realize the demon’s body has a bullet in it and won’t survive. Dean doesn’t seem the least bit disappointed and kills the demon. Sam wonders why Crowley would keep Amara on Earth, since it would be safer in Hell. When Dean tells him that Crowley hates Hell, Sam responds, “Oh right, I keep forgetting about you and Crowley, summer of love.” Sam and Dean eventually figure out where Administrative Hell is—an old asylum, of course. They plan to break in to kill Amara. Seems like an ambitious plan. Amara is stuck in her room, checking out memes online. Crowley clearly doesn’t know what memes are, but then again, we’ve never seen him use a computer. The King of Hell is old-school. Crowley tells Amara that he doesn’t want her to think he’s a monster, then proceeds to attempt to placate her with a human offering. But teenage Amara is sulky and claims she’s not hungry. Or she’s just a teen annoyed at Crowley’s attempts to parent her. Perhaps she’s a bit like Liv Moore in iZombie and her personality is affected by those whose souls she eats. Crowley tries to have a heart-to-heart with Amara, admitting he doesn’t know what he’s doing or how to forge a connection with her. He tells her, “What I do know is that you’re growing so fast, and it terrifies me.” Amara’s no dummy and knows he only wants her for the power she’ll wield. At their hotel, the boys are preparing to enter the asylum. Sam asks Dean if he’s ready to kill Amara. We were wondering the same thing. Dean is taken aback, thinking for a moment that Sam knows about his secret connection to Amara. But Sam just means that they don’t even know if they can kill her. Dean tells Sam that she’s too big of a threat to wait. In Administrative Hell, Crowley tells Amara that through his experience and knowledge, he does have something to offer her. When asked what he wants, Crowley explains, “You give me your patience. I’ll give you my protection. Until you decide you don’t need it anymore.” Amara agrees. Really, she has nothing to lose and it’s all up to her how long she keeps the agreement. Castiel has spotted Metatron on TV. The graceless angel has been videotaping human tragedy to sell to the news. Classic Metatron. In an alley, lit by nothing but a fluorescent cross, Metatron is videotaping a bleeding man, who begs for help. He tells the dying man that there was a time when he could have, but still wouldn’t have, saved him with a snap of his fingers. Castiel comes up behind him and says, “I can.” Metatron wasn’t expecting to see his angel nemesis. He videotapes Castiel healing the man, but Castiel then knocks the camera out of his hands. Sam and Dean have arrived at Administrative Hell. Elsewhere in the former asylum, Crowley’s minions are reporting on the business of collecting souls. Crowley pretends to listen but is really reading Why She Fights: Understanding Your Rebellious Teen. A typical committee meeting. When Castiel cuts him off, Metatron thinks he wants the demon tablet and tells him how well hidden it is. But in fact, Castiel has already found it hidden under Metatron’s bedbug-ridden mattress. When Castiel asks Metatron what he knows about the Darkness, he responds, “The band?” Metatron admits that God may have let something slip about the Darkness, but tells Castiel he doesn’t have to tell him anything. Castiel threatens Metatron, but the scribe isn’t worried because he notices that Castiel has “gone full wuss.” Metatron accuses the angel of being paralyzed by trauma and fear, saying that Castiel can’t even hit him. Cas shows him otherwise. Sam and Dean have made their way into the asylum and trick the demon guarding Amara’s door with a recording of a message from Crowley on Dean’s phone. Looks like that Summer of Love paid off. Sam tells Dean to go take Amara out while he takes care of the other demons. Before Crowley can kill Dean, Amara intervenes. Looks like those souls have done her some good. Or bad, depending on your perspective. Amara tells Crowley that she doesn’t need his protection, nor his captivity. Sam continues to fight demons in the hallway, while Dean is with Amara. The demon realizes Sam is holding back, saying, “You trying out some kind of no-kill policy?” The demon tells him as a hunter he should know that pacifism doesn’t pay. Sam stabs the demon with an angel blade, and goes after the last one. He holds the blade above the demon. Meanwhile, Dean tries to break down Amara’s door, but is knocked down by one of his visions. Inside her room Amara tells Crowley she will spare his life if he gives Dean safe passage out of Administrative Hell after she leaves. He gloweringly agrees, and Amara sends him on his way. Metatron admits to Castiel that he was faking the whole pulling-himself-up-by-his-bootstraps thing. He describes the indignities of being human such as making your rent and ham rinds. Castiel won’t be manipulated by Metatron and demands to know about the Darkness. Dean stands silent, as if in a daze, as the Darkness talks about their connection: “Tell me—what is happening here, between us? You save me. I save you. Why? You were the first thing I saw when I was freed, and it had been so long. Maybe that’s it. My first experience of His creation. You can’t help but represent that for me. The sweet triumphant, the even sweeter folly of what he’s wrought. There’s no fighting it. I’m fascinated.” This would only be slightly less creepy if Amara weren’t a teenager. But we’re also mesmerized by what she’s saying. The Darkness tells Dean what she came here to do: “Settle an old score. The oldest score.” Uh, kinda vague, Amara. Despite her lengthy monologue she has revealed little. Luckily Castiel is more effective at getting Metatron to share some specifics about the conflict between God and the Darkness. Dean holds the knife near Amara’s heart, but does nothing. She softly says, “Told you,” referring to her earlier claim that he would never hurt her. Sam finally breaks into the room. When Amara throws his brother up against a wall, it seems to wake Dean from his reverie. He walks towards her, but before we can see if Dean is actually capable of killing the Darkness she knocks him aside as well. Back at the bunker, Dean is upset that Castiel let Metatron go. Castiel tells him that now Metatron is human and still hunted by the angels, he’s no longer a threat. Castiel asks the hypocritical Dean, “You said you were close. Dean, how’d she get away?” Dean claims she overpowered her, but Sam and Castiel don’t seem to believe him. Dean angrily asks what the plan is, where on Earth will they find something to stop her. He glances at Sam and mockingly says, “I don’t suppose God’s decided to share any wisdom on the matter.” Sam says that he’ll look into the lore and walks away. Once Sam gets out of the room, he grabs the wall to stabilize himself. it’s clear he’s having another vision. Sam has a vision of the Cage, suspended in Hell. Who is responsible for these visions? Is is Lucifer trying to trick Sam into freeing him? Is it God, whom he prayed to in “Form and Void?” Is is someone else reaching out to Sam from beyond? As Urge Overkill’s version of “Girl, You’ll Be a Woman Soon” plays, we see Amara walk through the streets, exploring God’s creation. She seems to like it. Meanwhile, Crowley’s not so happy about having lost his prize, and Dean is drinking away his sorrows. “Our Little World” still leaves us scratching our heads about The Darkness, but we did get some great reveals in this episode of Supernatural, the big one being that the Darkness is God’s sister (would that position Crowley as God’s uncle?). Once Metatron says it, the idea of the Darkness as God’s sister makes a lot of sense, but it was still kind of mind-blowing when he dropped that knowledge bomb. Our favorite revelation, though, was Crowley’s confession that he couldn’t bring himself to kill Dean before, despite his many opportunities. Sure, we all knew it, but to hear him admit it was just so great. Another thing the episode showed us was that Sam and Dean are lying to each other again. It’s not clear what power Amara has over Dean and if he can tell Sam about the connection, but we think he probably could if he wanted to. Sam at least made an attempt to be honest with his brother, which only led to Dean’s derision. They may be going down a path similar to Season 5 where they find themselves drawn to different sides. Though we don’t love how the Winchesters constantly make the same mistakes, it’s creating some interesting divisions. Will Sam be breaking Lucifer and Michael out of the Cage to help fight the Darkness? Will Dean continue to be a foil in the fight and always save her? Though the casual Supernatural viewer who hasn’t kept up with Season 11 may have gotten a bit lost if they just turned on “Our Little World,” it was a great episode within the overall story arc. Let this be a lesson for all to keep up.